When properly used, personal digital certificates allow the user to be identified as the sender of an email, as the final authority on a word processing document or spreadsheet, or as the signer of a PDF file. This non-repudiation, especially for PDF files, is frequently used as a suitable substitute for a handwritten signature. In fact, digitally signing PDF files is the preferred format for distribution of certain documents at UT Health San Antonio. First, you'll need to request your digital certificate. 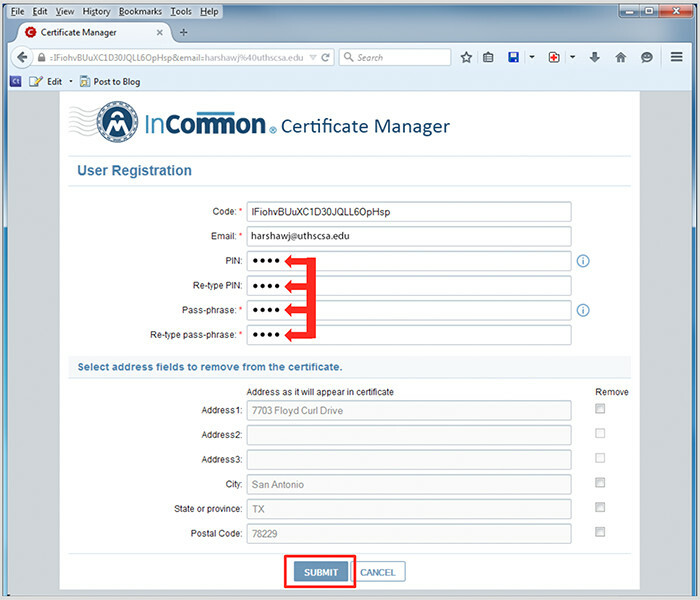 Follow the steps in TeamDynamix for requesting Digital Certificates. If you are making a request for a group of users in your department, download the Digital Certificates Bulk Request spreadsheet and attach it to the ticket in TeamDynamix. When you've completed your request, you'll receive an email telling you the certificate has been ordered along with a link back to the page. Shortly thereafter, you'll receive an email from Certificate Services Manager with the subject line "Invitation Email - You have requested email certificate validation". Though “invitation” may lead you to think the message is spam, it is not. It will provide the link to download your certificate, and the next instructions cover that process. You will have approximately five minutes after clicking this link to download your certificate (for security reasons). Please contact InfoSec@uthscsa.edu if you have surpassed this time limit and need another invitation request be re-issued. Next, you'll need to download your digital certificate. Before your digital certificate can be used on your computer, you must download it and save it to a secure location. This will be necessary if you need to install the certificate in another application or on to a new computer. NOTE: Be sure to DOWNLOAD your certificate; do not run it. When you download it, remember the password and PIN used. Once you've downloaded your digital certificate, you can incorporate it into Internet Explorer and other applications. Follow these instructions to download your digital certificate. 1. Once you have requested your digital certificate, you will receive an email with instructions for downloading your certificate. NOTE: The sender is “Certificate Services Manager” and the subject line is “Invitation Email – You have requested email certificate validation.” This is NOT spam. The University validates certificate usage by only sending the invitations to Health Science Center email addresses. Double-click to open the message. 2. Click the link to go to the Certificate Manager site to download your certificate. NOTE: This link can only be used once, so click it when you have the time to complete the process (less than 5 minutes). When clicked, a browser window to the Certificate Manager will open. 3. The Certificate Manager browser window will already have the “Code:” and “Email:” fields filled in. These values will be the same as those in the email notification. 4. Enter both a personal identification number (“PIN”) and a “Pass-phrase” in their respective fields, and re-type them where instructed. For ease of use, use the same value for both the “PIN” and the “Pass-phrase ”. When installing on your computer, some applications ask for a PIN, others ask for a password; using the same value for both avoids confusion. Remember this value. Once you’ve entered the “PIN” and the “Pass-phrase”, click the “Submit” button. 5. Once the “PIN” and “Pass-phrase” are accepted, you’ll be presented with the “Digital Certificate download” screen. Click the “Download” button. 6. You will be presented with the following window to save your digital certificate. 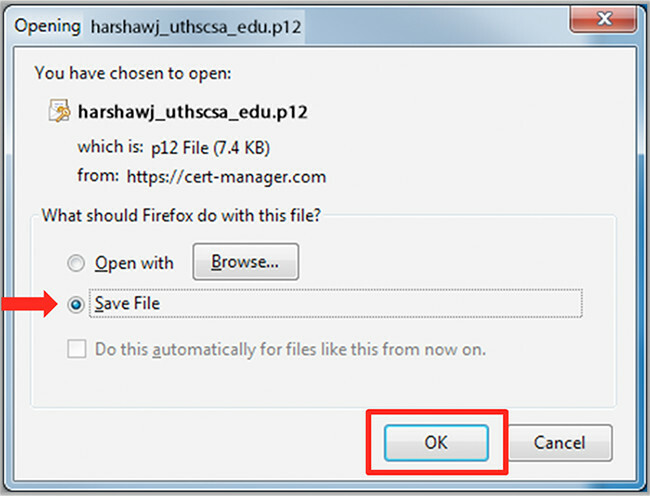 Ensure the radio button next to “Save File” is selected, and press the “OK” button. Save the file to a secure location and remember it. You may also want to make a copy of the file at a separate location, along with the PIN/pass-phrase. Don’t forget your PIN/pass-phrase. 7. You are now ready to install your digital certificate on your computer in Internet Explorer and other applications.